Do You Crave The Ability To Be Gluten Intolerant? This Video Will Show You How! We all have one of those friends whose body rejects gluten and so thinks it elevates them to some kind of higher level of existence. Or, they think they're gluten intolerant but really they just like to be treated like some special, delicate rare flower. You know the type. Anyway, they're hilariously spoofed in this video by JP Sears, as part of his Ultra Spiritual Life series. 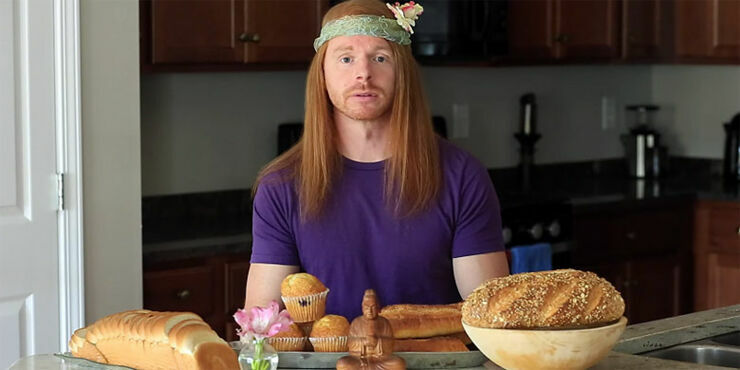 JP Sears is a brilliant parody of new age self-help gurus, billing himself as "an emotional healing coach, international teacher, world traveler, and curious student of life." In the video How to Become Gluten Intolerant he totally nails how annoying and contradictory some people can be when it comes to their gluten intolerance. Like his statement Seclusion Makes Gluten Healthier where he notes, "When no one's around you somehow become less gluten intolerant." Have a watch of the video and, as Spears says, "Here's your chance to jump on the new age conscious band wagon!"